You know I like Usborne Books, correct? I think that they are out-of-this-world fabulous and of the highest quality. It is a sincere pleasure for me to introduce you to a couple of children's atlases that you might find useful to use with your own kids. Bookworm1 is big into animals and in the past few months he has also been asking some questions about maps and geography, seeing that mommy and daddy have been traveling. We've been looking at a map of the United States and identifying places like New York, Washington D.C., Texas and California. When I saw that Usborne Books & More had an Animal Picture Atlas, I knew it was something worth checking into! This book is incredible. It "is all about animals and where they live." The first page spread contains an illustrated picture of the world, giving the young reader perspective. It focuses on the continents, primarily, and shows pictures of a variety of animals, pinpointing where on the globe you might find them. As you turn the page, the book begins to focus on each continent, beginning with North America. Where do musk ox live? Bighorn sheep? Prairie dogs? By looking at this layout of North America, you can find out whereabouts you might find any one of these animals. In the bottom left hand corner of the page, there is a smaller map of the world so that you can still see where North America is located in the grand scheme of things. After going through each continent, towards the back of the book you can read information concerning specific species such as: monkeys and apes, big cats, bears, birds, polar animals, etc. Animal Picture Atlas is illustrated by Linda Edwards and is, in every way, a delight. I think she offers the perfect amount of detail to each illustrated animal, while still keeping things cartoonish enough to draw a youngster in. We have poured over this book for hours. 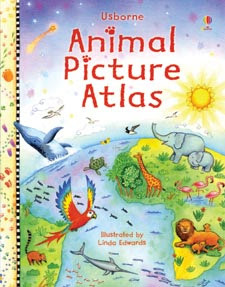 I love it because it entices Bookworm1 to explore maps and learn about different continents and countries by using his favorite subject matter at the moment - animals! 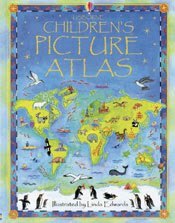 If you are looking for something for slightly older world explorers, you might want to check out the Usborne Children's Picture Atlas. Using the same concept as The Animal Picture Atlas, illustrator Linda Edwards once again helps us explore the various continents and what we might find on them. Instead of limiting the subject matter to just animals, you can also find pictures of skiers, cowboys, paddle boats, cacti, chili peppers and snowmobiles gracing the map of North America. It is easy for children to see where certain activities take place and where certain produce is grown through the use of this book. The Usborne Children's Picture Atlas starts by giving the reader a bigger picture of the globe though - by beginning with "The Universe." There is a page spread explaining what maps are and how they are used, as well as an explanation for the difference between countries and cities. It starts big picture and whittles its way down to our individual communities and how we transport ourselves around the globe. The book concludes with the Atlas and illustrations. This book is also a great resource! The whole family was impressed by both of these books and I have no hesitations offering them up for your consideration. These are fabulous, fabulous books! Therefore it is my great delight to inform you that Usborne Books & More as offered up a copy of each of the above titles to one Reading to Know Reader. How to enter the contest? Simply leave a comment below. This contest is open to U.S. Residents only and will be open through Thursday, September 9th. I have always loved Usborne, especially when I was teaching. Now I love them as a parent. For our family (esp M who always asks where is that?) I hope to win! Looks wonderful. My kids would love perusing this one. Thank you for the contests! I'm a map fanatic so I'd love to share these with my girls. Love to add to our little library! We love Usborne books as well! My guy loves to check out the globe and compare places we visit to one another and an atlas would be perfect. I love Usborne books!! I would love to explore these with my little one! I love Usborne books and this one looks great. This looks like a fun book even for a parent! Jordan is very into animals as well and soaks up facts about them, whipping them out later and amazing me at what he remembers. :) What a great giveaway! We were just in the library looking for a good children's atlas this week and didn't turn up much. I would love to win these! And thank you for the reviews of them, so that if I don't win I can look for them! These would be great resources for our homeschool library! cool book. thanks for the chance to win. I love Usborne books, my students would love this book. My son would LOVE these. He's really into geography. Usborne books have always been a favorite of mine for my kids. They seem to be the only ones that can hold their atttention over and over again. These books also have so much information packed into them and the fact that we can use them year after year is a huge help. I love Usborne books and these look great! Thanks for the chance. I love atlases. They are so wonderful for learning. I love Usborne books so much that I briefly sold them. We don't have these though. Please enter me. I love reading Usborne books with my kids. I would love to win a copy of the Children's Atlas! I LOVE Usborne books! They are simply wonderful! we have a lot of usborne books but non of these. I would love to add them to our collection. I love Usborne, and would love to win this! Please enter me! My kids know the animal's names but understanding where they live is another story. Sounds like a great book. My son would love this, please enter me. These atlases look amazing! I think my students would be really interested in them. I love Usborne books too! Thanks for the giveaway! Sounds like a great book! My kids have always loved maps and map books. Thanks for the chance.